DeVos is taking her federalized school choice plan to Congress where it will be introduced in legislation in the Senate by Texas Sen. Ted Cruz (R) and in the House by Rep. Bradley Byrne, a Republican from Alabama. 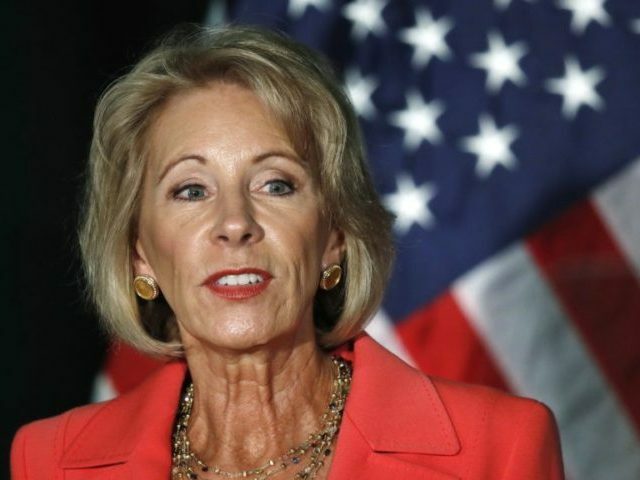 Many who have been urging the Trump administration to dismantle the federal education department, however, warn another federalized program will further expand overreach into education. The U.S. Constitution provides for no federal role in education, except in the nation’s capital, in the military, and among Native American tribes. As U.S. News & World Report observed, under DeVos’s proposal, individuals and companies would obtain a federal tax credit if they donate to organizations offering scholarships to students to attend the schools of their choice. Individuals and companies would be allowed to donate up to ten percent of their adjusted gross income. Many of the details of the federalized program, such as who is eligible, education providers permitted to participate, and accountability for the federal taxpayer funds would be given to the states – although, as with Common Core, the incentive to create such programs would come from the federal government. “This is an opportunity for states to take advantage of money that would be available to them, for programs that they design,” said an unnamed education department official, according to Education Week. The key element of the proposal is freedom. Freedom for everyone involved. Students, families, teachers, schools, states can choose to participate in the program. Or they can elect not to participate. That’s what freedom is all about. Let me be clear: I firmly believe every state should embrace education freedom. But those are decisions families and communities must make. This is not another mandate. We know gaining this freedom will require more work in some states than others. But as more states offer more options to families, demand will rise and pressure will mount on those who have not yet embraced the opportunity. While conservatives and constitutionalists heartily support parental choice of education options, they draw a bold line where the federal government takes over the project or incentivizes states to enact it through federal taxpayer funds. DeVos, Cruz, and Byrne are looking to skirt the control problem, sticking with tax credits instead of vouchers, and letting states opt in. But not only is this unconstitutional—taxes are authorized to execute specific, enumerated powers, not to lightly engineer state policy—it won’t, ultimately, prevent encroaching federal control. If enacted, the credit would spur people to demand their states participate, and as more schools benefited from federally connected scholarships all schools would be financially pressured to use them. But the federal government will have the power to decide which state programs are or are not eligible, and on what grounds. Lindsey Burke, director of the Heritage Foundation’s Center for Education Policy, and Adam Michel, a senior policy analyst in the Grover M. Hermann Center for the Federal Budget, warned such an effort could actually reverse the school choice gains already made as well as recent tax policy reforms. “Even if Republicans get a perfectly clean version of the tax credit through Congress—a tall order given the composition of the House—the door would be open for future Democratic administrations to extend a regulatory toehold into every private school that accepted students on scholarship,” she asserted.